After stretching and taking a couple minutes to rest, I showered up and we headed north on the peninsula to check out a couple of county parks. 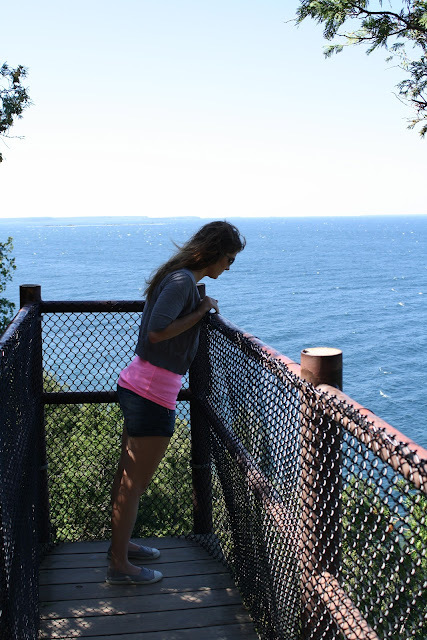 Our first stop was at Ellison Bluff County Park, which had some nice trails, picnic tables and a little lookout deck offering gorgeous views of the bay. But the views were phenomenal, so we got over the height fright. Both of us were super hungry at this point, so we drove into Ellison Bay to find some grub. 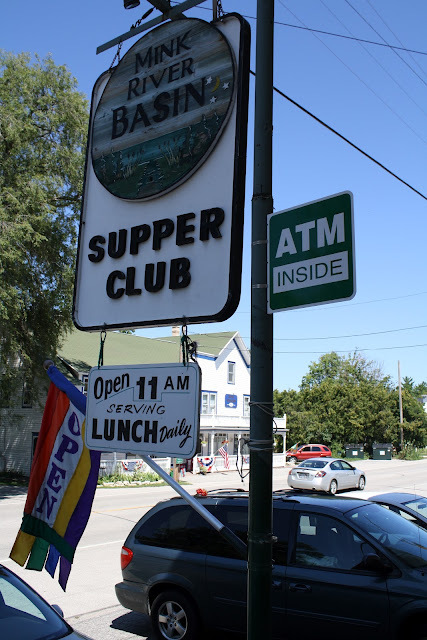 The Mink Basin Supper Club looked like a decent place to grab a bit, so we stopped there. Guess which door we entered through? While there, I had a basic cheeseburger and fries and Eric got a chicken sandwich with cherry salsa and a gigantic side of cheese curds. I'm sorry I didn't snap a photo, but we were so engrossed in our meals (and the rhythmic gymnastics playing on the TV) I plum forgot. The burger was dang good, as were the fries. And Eric loved his sandwich. We took half the cheese curds home to enjoy later. After refueling, we drove to Door Bluff Headlands to do a little hiking. 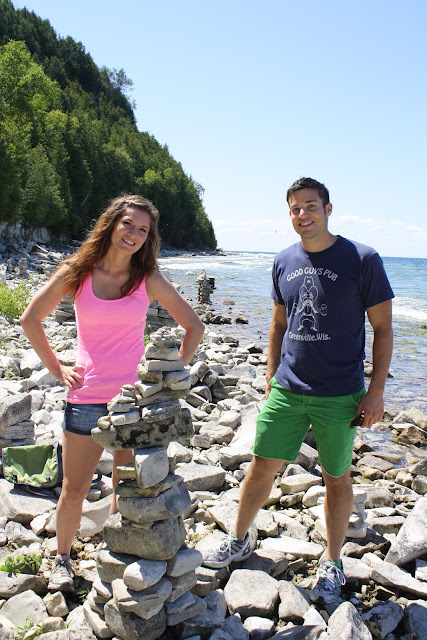 Naturally, we had to make a rock formation of our own. 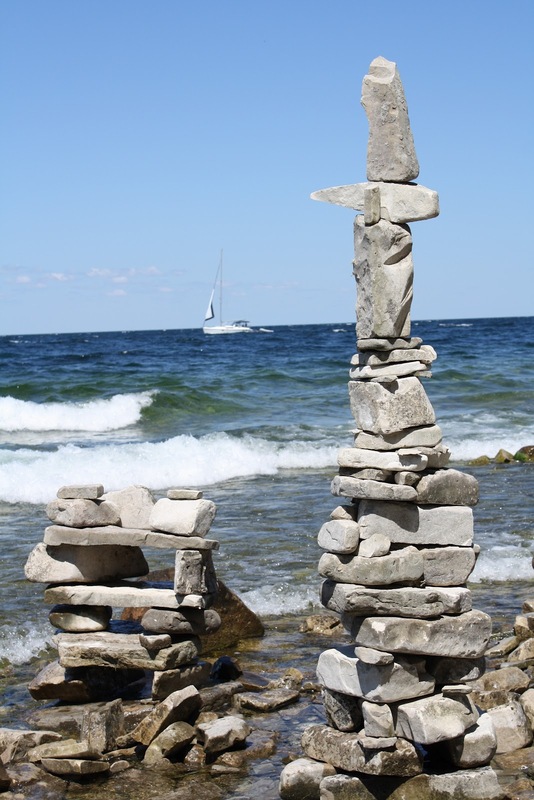 To give our formation extra flair, we added a bunch of small pebbles on the top... rock sprinkles! Although it wasn't the tallest formation on the shore, we were still proud of our creation. Pictures don't do this area justice. It was just so incredibly cool to be down there on such a clear, sunny day amongst all those towers of flat stones. We spent quite a bit of time down there, walking along the shore, soaking up the sunshine. Hands down our favorite moment of the entire trip. After experiencing our fill of nature, we decided to get down to business and head to a couple wine tastings. Door County has six different wineries throughout the peninsula, most of them carrying sweet wines made from the fruit grown in the area... most notably Door County cherries. The first winery we stopped at was Stone's Throw, a California-style winery with more traditional wines. It was $5 for a tasting, which included five different wines and we were sent home with the glasses we tasted with. Stone's Throw is a really beautiful building with a rustic, Italian feel. It also has a bar and Italian restaurant on site. The patio of the bar was hopping that day! People were just sitting outside, sharing bottles of wine and enjoying the live accordion music. Our next stop was at Lautenbach's Orchard Country Winery. We visited last year, so I won't go into too much detail, but we ended up buying a bottle of their Cherry Blossom wine (which was also one of my favorite's from last year) and a jar of their No-Sugar-Added Cherry Jam. Hey, when in Door County.... cherry up. 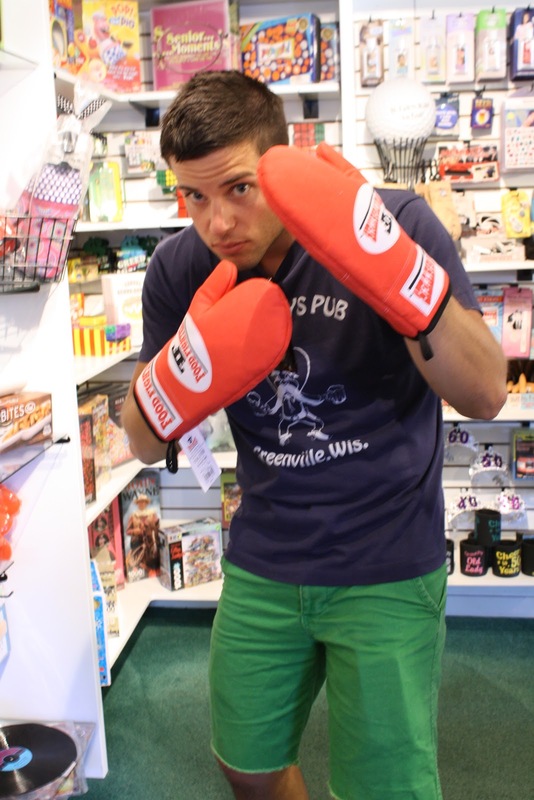 Literally two days earlier in our kitchen, he mentioned he thought it would be awesome if he could have some oven mitts that looked like boxing gloves. We both kind of laughed it off, but this store actually carried his dream! Dinner was wood-fired pizza at Wild Tomato for the night. Upon arriving at 7:15, we were told it would be an hour wait for the two of us. An HOUR?!?! I'd heard great things about their pizza, so we decided to wait it out, walk back to our car, park it closer (we were parked about half a mile away) and by then should have enough time for a drink before being seated. 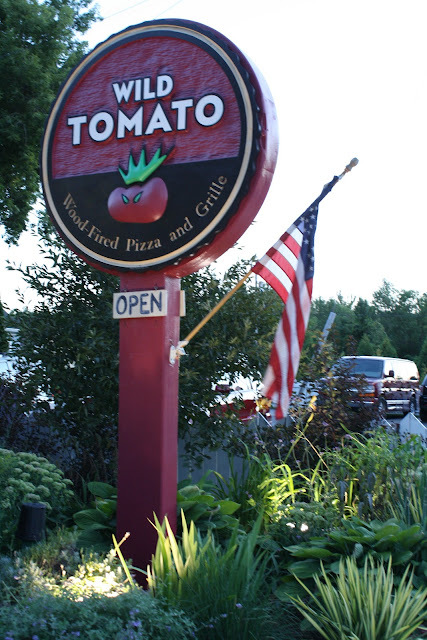 Wild Tomato is a minuscule little place (their bathrooms are on the outside of the building! ), so it's no wonder the wait was so long... limited seating! It had a lively vibe and a great beer selection. Their beer menu took at least twice as long for me to skim through than their dinner menu. We ended up ordering a sausage, mushroom and onion pizza; it's our standard pizza-joint order, but we wanted to compare this pie to some of our favorites. The verdict? I really liked the sauce and overall it was a really good pizza, but we still love our hometown favorite, the beloved (and dearly departed) Mama De Marini's more. 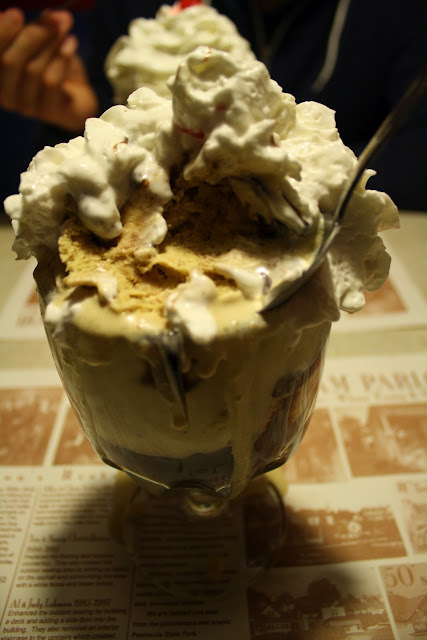 As if all that tasty pizza wasn't enough, we just had to finish our night at an Ephraim classic: Wilson's Restaurant & Ice Cream Parlor. This little gem whisks you back to the 1950s - I was wild over the cute, retro decor. For it being 9:30 at night, the place was really hopping! 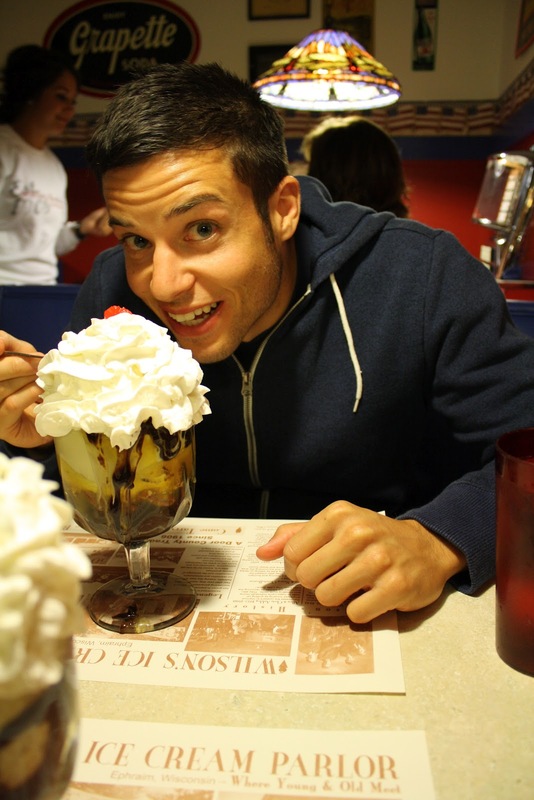 There was a long wait for a simple cone, but Eric and I were craving sundaes, so we took a seat inside. After perusing the sundae menu, I, of course, had to choose one with S'mores-flavored ice cream (holy frozen cow, you guys... the S'mores ice cream tasted like creamy Golden Grahams... in a good way), topped with hot fudge and a pile of whipped cream. Eric's sundae was hot fudge, pecans and caramel. 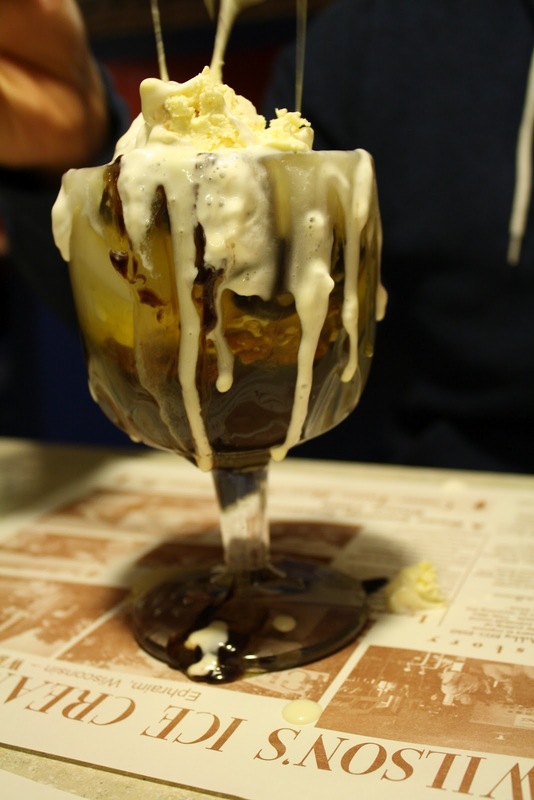 When our waitress brought us our sundaes, our jaws dropped at the size of them... we had no idea what we were in store for! In fact, not only did Eric manage to polish off his own sundae, but he finished off the remaining 1/3 of mine I couldn't muster! My hero. Needless to say, we waddled back to our motel (which was, thankfully, just a few yards away) and declared we were never eating ice cream again..... for at least a couple weeks. 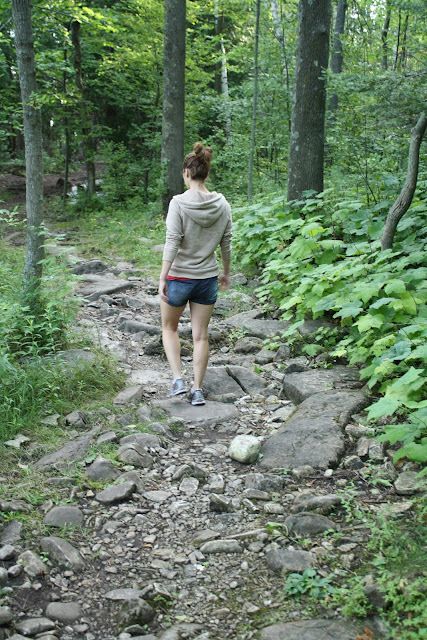 The next morning, we woke up with bellies still full from ice cream, so we decided to get an early-morning hike in. 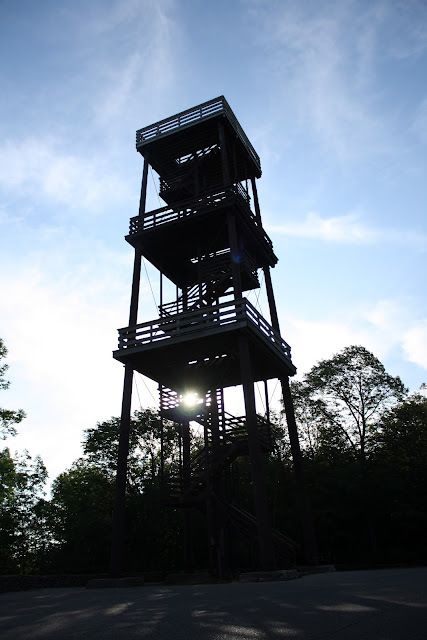 We went back to Peninsula State Park to check out the Eagle Trail and Tower. The tower provided incredible views of the bay, lake and shoreline. It was so peaceful being up there early in the morning, which no one else around. 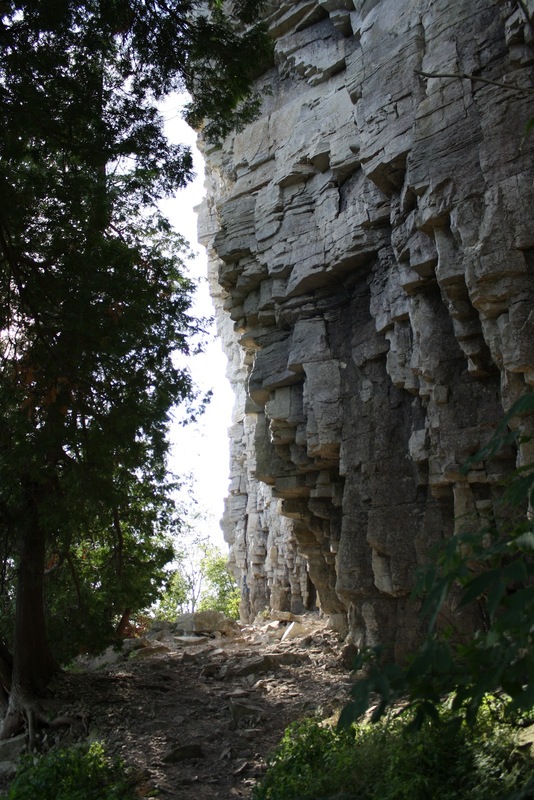 When we came down from the tower, we headed over to hike the Eagle Trail, which the trail map described as "two miles of difficult, rocky terrain." We were up for the challenge! And they weren't kidding when they said this trail was rocky! There's no way we could've made our way through wearing flip flops. The hike was an absolute blast, and was filled with awesome sights. We even found a few little caves in the bluffs! Of course, Eric had to take the opportunity to pretend he was hibernating in his very own cave. Our hike took longer than expected, so by the time we were done we were famished! We stopped at nearby Good Eggs in Ephraim, which I'd heard really good things about. Good Eggs Breakfast Cabana is an unassuming little roadside cafe with outside-only seating, whose food offerings are simply smoothies or breakfast wraps. Eric and I both ordered a wrap, and were taken to the outside "overflow" line, to watch them be prepared to specialty order. You guys... I could go on and on about this breakfast wrap. It's a simple meal, sure, but it was so dang tasty. Eggs, peppers, onions, mushrooms, pepperjack, green onions, black-bean salsa, hashbrowns and, naturally, Sriracha, all piled in a chipotle-flavored wrap. It was a beast, but I downed it all fairly quickly. We will definitely be back next time we're in town! After breakfast, we checked out of the Ephraim Shores and decided to go for a drive on the "Lake side" of Door County on our way south back home. We went to Whitefish Dunes State Park, where we were pleasantly surprised with one of the nicest Lake Michigan beaches I've seen in Wisconsin. The clear, sandy beach stretched for what seemed like miles, and it was packed with people enjoying the sunny weather and mild waves. I was feeling really tired (I think it was a bit of the end-of-vacation blues), so we didn't stay for too long, but if we had another day I could easily see myself just lying out on the beach all day. So relaxing. After leaving the beach, we proceeded to make the three-hour drive home, where we were grumpy and sad for hours after vacation ended. 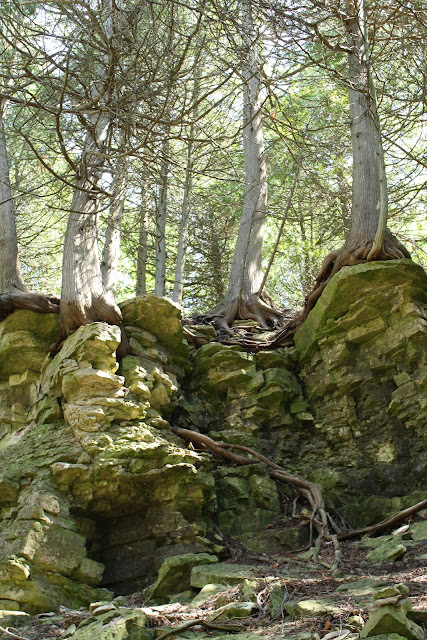 This was an incredible trip to Door County. Nearly three days of being active, eating delicious food and being totally touristy. 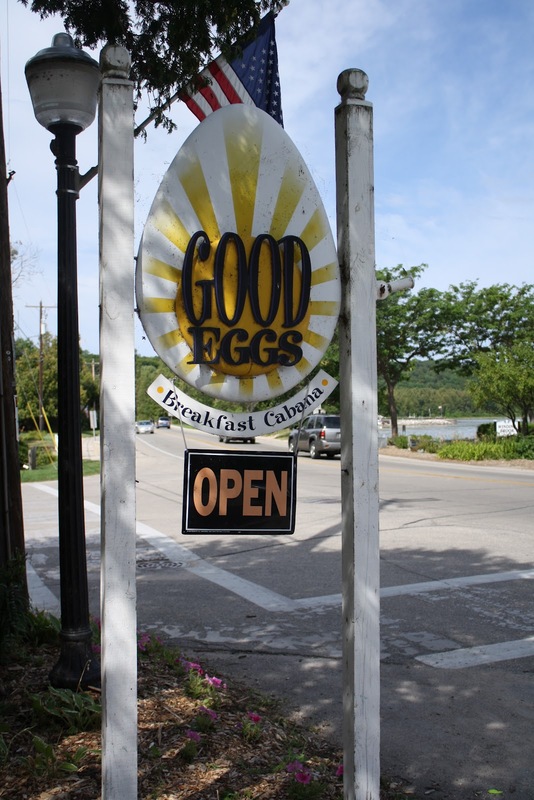 We could have used another three days to do everything we wanted, but the good thing about Door County is no matter how many times you visit, there's always something new to experience on your next trip up. Have you been to Door County? What's your favorite thing to do while there? Anything I simply can't miss on the next visit?